Thanks to the tip from one of the best blogs out there - let's get digital, I had a real pleasure to acquaint myself with super fat, wonky 8-bit neon sound of Pixelord from Russia. The debut 4-track EP "Lucid Freaks" by Alexey Devyanin, a Moscow-based veteran of experimental music, best-known for his Gultskra Artikler moniker, is simply too good to be kept buried in the vast ocean of blogosphere. I've never heard of this guy, but from now on I write down his name waiting for more stuff coming soon (like already announced remix EP). 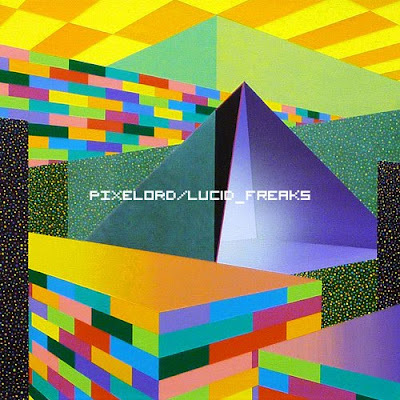 Pixelord delivers twisted hip hop beats and lots of 8-bit, digital bleeps and beeps, all bathed in Lucky-Me's neon synths. The production is super tight and fans of Slugabed, Loops Haunt, Shlohmo, HudMo should check this release. It's even difficult for me to mention best tracks as they are all top quality. Definitely an artist to watch in 2010.